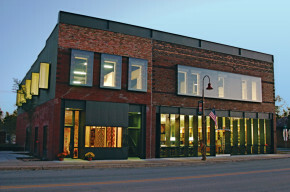 Taking one of Arkansas’ historic buildings to a modern architectural award winning structure came with challenges. The new foundation for the addition and elevator had to be built with the existing water table being one foot below the finish floor and the aging, load bearing brick walls had to be restored to withstand the strains of the renovation. We blended old with new and brought the outside in with large new windows and a massive skylight. Finishes included custom cherry book shelving, new carpet, restored heartwood pine floors, and painted ceilings. The project was completed in 12 months and received an American Institute of Architects award.